The Downtown Los Angeles Chapter of the Japanese American Citizen League and the Japanese Women’s Society of Southern California have selected four exceptional Japanese American community leaders for the 2018 Women of the Year Award: Joyce Wakano Chinn, Noriko Kamimoto, Miyuki Namiki, and Victoria Oshiro Nishiuchi. 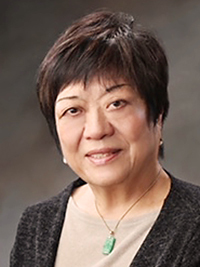 This year’s luncheon event will be held at the Quiet Cannon, Rooms Crystal 1 & 3, 901 N. Via San Clemente, Montebello, on Sunday, May 6, at 12:30 p.m.
• Joyce Wakano Chinn was born on April 10, 1947 in Santa Maria to Clarence and Fumiko Wakano. She views her father as a mentor. He was a gardener in San Fernando Valley and worked for many people in the television industry. After he returned from a long day of work, he often volunteered in the evenings, going to meetings for the Southern California Gardeners Association, Kyodo System Japanese School, and Seinan Anglers Club. He was one of the first to begin a local credit union. Chinn’s mother was a traditional housewife and took her to school, swimming lessons, piano lessons, and Japanese school. Chinn attended both American and Japanese schools concurrently. She graduated high school level, Ko-Chu gaku-bu, and graduated from UCLA with a teaching credential in elementary education. She taught 5th and 6th grades from 1970-2008 with LAUSD and was honored by the Japanese American Optimist Club and by the Cherry Blossom Festival as an outstanding educator. In 2012, Chinn received the Nikkei Spirit Award from the Japanese Chamber of Commerce of Southern California. She volunteered for over 43 years beginning in 1974, when a friend asked her to answer phones and to do light office work for the Nisei Week Japanese Festival. That summer was the beginning of her continued involvement with Nisei Week as its office manager. Through Nisei Week, she has made many friends and became acquainted with the Little Tokyo community as well as the larger Nikkei community. As a member of the Los Angeles-Nagoya Sister City Affiliation (LANSCA), she has helped organize a children’s art exchange between the two cities and has traveled to and from Nagoya many times. When Chinn joined the Japanese Women’s Society of Southern California (JWSSC), she immediately became the English secretary, sharing duties with a Japanese secretary. She has worked hard with JWSSC and the Oshogatsu Amazake Booth, co-chaired the Shinnenkai/Installation Lunch, assisted with the JWSSC Nisei Week Booth, and helped with the annual visit to Kei-Ai Nursing Home. Chinn also volunteers with many other organizations. She mentors seniors in a creative writing program at Sakura Gardens as part of the Nikkei Women’s Legacy Association Terasaki grant. The memories of the seniors are made into a book annually and are archived at UCLA. For many years, she has volunteered for the Japanese American Optimist Club, helping with their Halloween and Christmas parties for inner-city students, judged an oratorical contest, and helped with a 5K run in Little Tokyo. Chinn has recently begun volunteering at Little Tokyo Senior Nutrition Services and gives out monthly taxi coupons for low-income seniors. 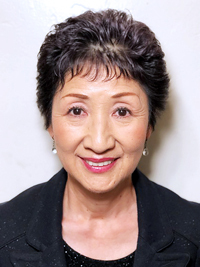 She is also a member of the Little Tokyo Rotary Club and participates in its monthly meetings and monthly maintenance of the Frances Hashimoto Plaza. She has been married to William Gregory Chinn for over 40 years and is grateful for his support in her many volunteer activities. • Noriko Kamimoto was born in Oku Aizu, Fukushima Prefecture in 1954. Her mother set an example of a strong woman who worked ceaselessly on the family farm. Kamimoto studied hotel tourism in 1972 and worked at the Imperial Hotel in Tokyo for seven years. Eager to see more of the world, she came to California. She met her husband through a mutual friend and married him in 1983. From 1983 to 1994, Kamimoto was a full-time housewife. All five of her children took kendo, shuji (Japanese calligraphy), and Kumon classes. Although it was challenging, her children are bilingual, and all were recipients of the Ikuei Scholarship program sponsored by the Southern California Japanese Prefectural Association (Nanka Kenjinkai Kyogikai). In 2000, Kamimoto was invited to participate in Japanese cultural activities by a friend who had been involved in the Nanka Fukushima Kenjinkai for many years. In 2008, she welcomed and conducted the 100th anniversary of Fukushima Kenjinkai. In 2012, Kamimoto participated as a board member in the Love to Nippon event at LAPD Headquarters, which the Fukushima Kenjinkai participates in annually with a booth and photo presentation. She also participated in the LA Daiku Charity Memorial Concert, the Charity Golf Tournament hosted by Nanka Kenjinkai Kyogikai, the “Thank You from Fukushima” concert by the Fukushima-Koriyama Boys and Girls Choir team, and the Charity Summer Festival sponsored by the Shinsengumi Restaurant Group for people affected by the Great Eastern Japan Earthquake. In 2013, Kamimoto attended the first Overseas Fukushima Kenjinkai Summit at the Fukushima Prefecture Office, participated in the annual Walk the Farm event at Tanaka Farms, and attended the 90th anniversary of Honolulu Fukushima Kenjinkai as a representative of Nanka Fukushima Kenjinkai. In 2014, she participated in the Love to Nippon event, which featured a seminar by Professor Yasuo Goto of Fukushima University. In 2015, when her husband, who was the 40th president of Fukushima Kenjinkai, suffered a stroke during his term in office, Kamimoto supported him with rehabilitation care, business, and activities. In the years she has spent in raising a family, Kamimoto has made many memories. Through her activities at the Nanka Kenjinkai Kyogikai, and her new role as vice president of Fukushima Kenjinkai, she has met many individuals from other prefectures and is grateful for the experiences. She believes that life is a grand stage that presents every day as an opportunity to be the best self you can be. With her children, she hopes to continue being active in the Japanese American community. • Miyuki Namiki was born and raised in Nagasaki. To fulfill her parents’ desire, she studied at the Christian school in Kwassui Women’s University, where education can be completed from junior high school to college. After graduation, she worked as federal government worker in Nagasaki University at the Department of Mechanical Engineering Laboratory, as well as the Department of Medicine, Accounting, and Administrative Affairs. In 1984, Namiki moved with her husband to Los Angeles, where she raised her two children. Her son graduated from NYU with a BA and MA in special education. He is currently working as a special education teacher to the severely and emotionally handicapped children. Namiki’s daughter graduated from CSU Long Beach with a BA, emphasis in graphics design. She is currently working as executive assistant at a real estate firm. In her early childhood, Namiki became familiar with calligraphy, abacus, flower arrangement, Japanese folk dance, and Japanese culture. She started Japanese tea ceremony in high school and has been continuing for the past 45 years. 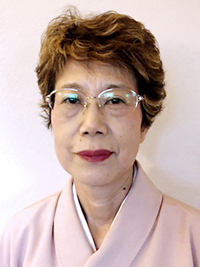 She has a professor’s certificate and teaches tea ceremony at her own home and in San Gabriel. Namiki also volunteers at Sakura Gardens, a retirement home in Boyle Heights, where she teaches and enjoys delicious matcha with the seniors. She is currently an instructor at Asahi Gakuen, where she has been teaching for the last 16 years. She taught and demonstrated tea ceremony to her students during their social studies class so that they could better understand the history and traditions of Japanese culture. As a part of her students’ Asian history class, Namiki lectured about the history of tea ceremony and held a demonstration at the Fuller Theological Seminary. As a member of the Omotesenke Domonkai of Southern California, Namiki has demonstrated tea ceremony during Nisei Week and participated in other events in different regions to introduce tea ceremony to various people. She has made tea at the consul general of Japan’s residence and assisted in the tea ceremony demonstration at Shosei-an in Glendale. In two practice places, she arranges tea ceremony in accordance with the season in Japan by the arrangement of the tea utensils, flowers, scroll, etc. In addition, Namiki hosts tea ceremonies for her guests so that everyone can learn about tea utensils and cooking, and how to proceed with tea events. She and others are making efforts to share a deeper understanding of the tea ceremony. • Victoria Oshiro Nishiuchi. It was very important to her mother that her children knew where they came from and who they were, that they understood that their grandparents emigrated from Okinawa to Hawaii and sacrificed everything so that they could have a better life. Nishiuchi’s parents, too, made the hard decision to move from Hawaii to Los Angeles when Nishiuchi was a baby so that the family could have a better life. Afterwards, the family moved from Los Angeles to Gardena, where Nishiuchi and her siblings grew up. Nishiuchi had a typical Sansei life of school: Japanese school on Saturday mornings, sports, and Girl Scouts. Her neighbor happened to be an active member of the Okinawa Association of America (OAA) and would invite the family to picnics and other community activities. She has fond memories of the summer picnics. This same neighbor also encouraged Nishiuchi to apply for an OAA scholarship. She is grateful for Mr. Nakata’s encouragement and the OAA’s support of her educational endeavors. After Nishiuchi started working, her mother joined Majinkina Honryu Aigen no Kai to study Okinawa dance and wanted Nishiuchi and her sister to study dance as well. Due to Nishiuchi’s busy schedule, she came to a compromise with her mother, and promised to help where she could. Her mother held her to that promise and thus Nishiuchi started her journey with the OAA. Through volunteering and actively participating in several of the community programs, Nishiuchi has gained a deep appreciation for the history and legacy of the Okinawa culture. This has led her to become a lifelong student of the Okinawan language, Uchinaaguchi. 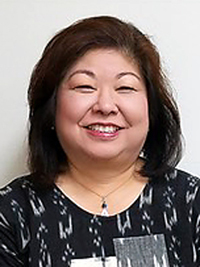 What started out as a simple promise to her mother has led Nishiuchi to volunteering on the weekends, typing in membership information on index cards to the Seisonen-bu treasurer, board member, chief financial officer, and vice president of the OAA. As a goodwill ambassador designated by the Okinawa government, Nishiuchi is always looking for projects or ideas to support and promote the rich culture of Okinawa. She often feels that her life has come full circle within the organization, from being that small child running down the hills of Elysian Park to a member of the Board of Directors. With a life filled with family and professional commitments, she is only able to be active with the OAA and pursue her passions with the support of her husband, Mitsuo Nishiuchi. Tickets are $45 per adult and $25 per child (ages 10 and under). Specify if vegetarian is requested. The deadline for reservations is April 21. Registration begins at 12 p.m. No gifts. Seating arrangements are made in tables of 10. Make checks payable to Downtown LA JACL. Mail check and list of attendees to Amy Tambara, Women of the Year Chairperson, 526½ W. Riggin St., Monterey Park, CA 91754. For more information, call Tambara (English/evenings) at (323) 722-3897, Rodney Nakada (English/Japanese/days) at (213) 628-1800, or Kay Inose (English/Japanese) at (310) 541-8022.